Well-to-do Victorian women loved to wear matching slide bracelets with bead-tipped foxtail chain tassels - one on each wrist. Women’s dresses were trimmed with abundant amount of fringe in the 1870s and these bracelets coordinated beautifully. They were designed in a similar fashion to the garter but because Queen Victoria was far too modest to wear one on her thigh, she had them made as bracelets! What an icon of Style she was! These gorgeous Antique Victorian Slide Bracelets are extremely RARE being a TWIN PAIR for babies/girls – often they became separated form their partner. They are designed identically so each one can clip into the other to be worn as one large bracelet. Please check the pictures for how this works. The actual slide is oval shaped and features a Black Enamel floral and foliate design, the technique of which is referred to as t’aille d’epargne or black enamel tracery. It is an enamel technique whereby an etched design is filled with powdered enamel then fired in a kiln. The richly stippled background adds further depth with the contrast of smooth, shiny & textured finishes. It really is amazing - I just hope my pictures do them some justice. The bracelet is formed of solid rings in a mesh formation. The end of the bracelet features a capping which house all the original 5 herringbone chain tassels (none are missing) with bead tipping – Amazing given some are usually lost or damaged if they are in place at all! The slide is designed as such that it can be moved along with the mesh sliding through smoothly. This allows each bracelet to be sized correctly for wearing snug on the wrist. They have an old yellow gold hue with subtle rose highlights to the slides. They have the silky smooth feel usually only associated with solid carat gold and expected of quality antique/vintage jewellery. Better-than-Excellent Antique condition! There is very little wear and that is to the underside. There is no damage or repairs evident, there is nothing that detracts from this Rare Pair’s Beauty. It is clear they have been used very little and one slightly more so than the other. 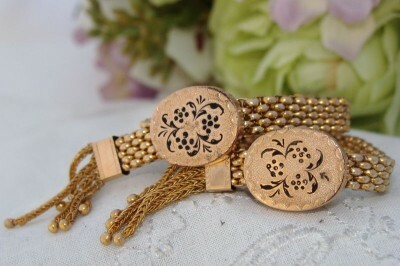 It is Extremely RARE to find such a beautiful pair of bracelets from the mid-Victorian in Original and Intact condition. At around 140 years of age, they are Museum Quality and would make a welcome addition to any Antique Heirloom collection. Perfect as a Wedding or Christening Gift which could be worn by a baby daughter, then passed on through the family.